Jobs – Water Treatment Operator for the City of Alcoa & Chief Petty Officer in the U.S. Coast Guard Reserve. 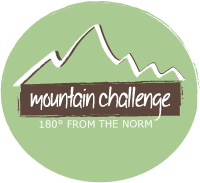 Meeting my lovely, artistic, & outdoorsy wife: fellow Mountain Challenger, Jennifer Deaver Stepp, Class of 2015. Thanks Mountain Challenge! Getting a care package from my Mountain Challenge and Peer Mentor comrades in the Middle East when I got deployed halfway through my junior year. It was the first care package I received overseas in the Spring of 2012, and I still have the signed Redskins flag in my room. I will never forget that. Hearing the reactions of international students on a GSMNP hike I led. That hike was made of awesome. Feeding the Rat on the Alpine Tower and in Rock-climbing I & II. This is the first time I’ve ever admitted it, but I am somewhat afraid of heights. I just closed my eyes and powered up, and before long I was actually having fun climbing! Every single time I put a harness on I feed that darned ole rat, and every single time I climb I have an absolute blast (once my knees stop shaking)! A funny story – On a canoe trip during Athlete Orientation, 3 “full grown” offensive linemen asked me if they could be in the same canoe. One canoe had to carry three, so I agreed, partly because I wanted to see what would happen, partly because water rescue IS my wheelhouse, and partly because, hey, it’s their experience that counts. About 50 feet from the dock, the canoe just kind of slowly sank. Once the water down flooded overtop of the sides, the canoe flipped to the amusement of all. The best part was that they laughed from the time they sat down till the time they made it back to the dock. I’ll never forget watching that canoe just slowly descend into the briny deep. Coast Guard Mo kicked in, and I towed them back to shore. Let’s just say a standard canoe rescue wasn’t possible with these guys! So much happy it can’t possibly be spelled W-O-R-K.